We've had manausa.com running the state of the art real estate website since 1995, and we're only days away from the latest technological make-over. We are making improvements to the "ease of use" for our visitors, and we have strongly beefed up our property search tool. In fact, we've gone from using packaged IDX feeds that are available to anybody in real estate to creating our own property search tool that is updated 96 times per day (every 15 minutes)! The Joe Manausa Real Estate Website will have a new, cleaner look. 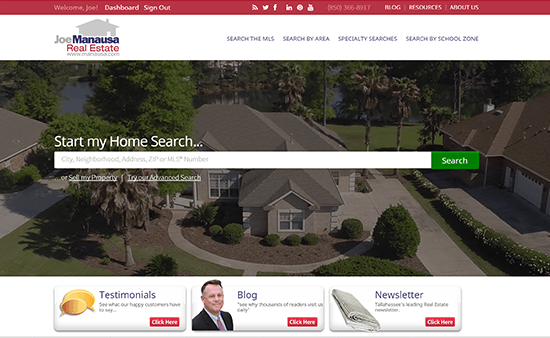 As most of our visitors end up wanting to look at homes for sale in Tallahassee, we feature the property search tool front and center on the home page. Right now, the site is in final production and can be seen and used at http://jmanausa.rewlec.com/. Most of the site has been completed, we're just working on the final tweaks. Some time in the next 10 days or so, we'll move the site to manausa.com. If you go ahead and register and start using the property search tool now, you're account will be fine when we make the move. But if you are using our old property search tool ... we'll be pulling the plug on that so I strongly recommend you start using the new tool today. Sure, more than half our visitors start by reading a blog post or two, or even registering for the Tallahassee Real Estate Newsletter. These will remain popular features on the new JMRE site. But we know that nearly everybody wants to look at houses. And homes that you can't even see in the MLS. 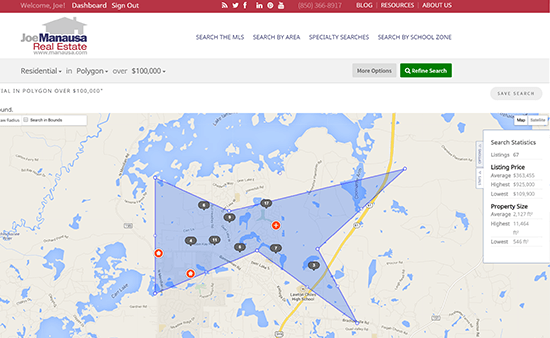 The improved property search tool is the gem of the new site, our own creation, and only available on the JMRE website. Since we control the programming for our new search tool, we will continue to implement additional features based upon the constructive feedback of our users. By way of example, many users asked for the ability to create a territory or boundary for their own custom search. We have done that. In the image above, we have used our polygon search tool to define an area and it then shows the homes listed for sale within that specified area, and the box on the right even provides a summary of the properties featured within the polygon. How's that for cool? Go ahead and give it a test-drive, we think you're going to love it. And if you have recommendations for additional features, just drop us a note and we'll put them on our list for consideration. By studying the searches of past home sellers and buyers, we have an idea of what many of our visitors like to see. We have created pre-set searches in order to make this simple. 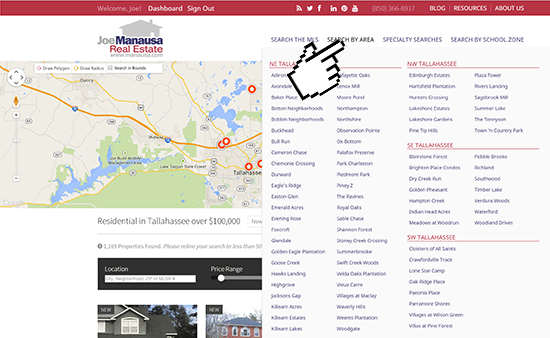 The image above shows what you'll find when you search by area, a menu selection that will be available from every one of our more than 8,000 pages on the Tallahassee Real Estate Website. These are the top subdivisions (meaning the most listings and most sales) in each of the four quadrants of the Tallahassee real estate market. So if you want to see all the homes for sale in Killearn Estates, simply click on the Killearn Estates link in the menu and you'll be taken there right away (and you can further tweak the search when you get there). You'll be pleased to find a map of Killearn Estates and all of the listings on the market in the subdivision. Saved property searches have been very popular with our users in the past, and the new property search tool allows the flexibility to create as many searches as you would like. Let's say you own a home in Southwood. You could set up a search of homes for sale in Southwood, limit it to homes that are similar in size and age as yours, and then have the search results emailed to you weekly (if you are going to be hitting the market in the next few months), or monthly if you plan on selling your home later in the year. This way, you will receive an email featuring your competition as often as you'd like to see it. If you are currently on the market, I would recommend you set one up for a daily update (so you know as soon as possible when the field of competition for homes like yours has changed). So take advantage of the ability to save multiple searches, you can have your searching "done for you" and delivered right to your email inbox. 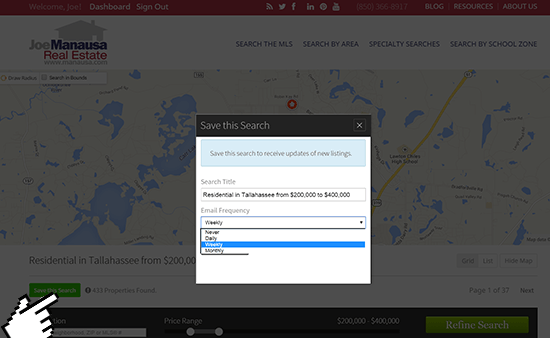 If you are already using a property search tool for the Tallahassee real estate market, I urge you to give this one a try. Quite frankly, no other one can compare. The large national sites just can't afford to update small markets like Tallahassee as often as we do, and that is why they feature so many homes that have sold long ago. Just follow this link to our new site and start using the best property search tool you will ever find.